We briefly discussed the Republican exodus in the section: 1939, the republican exodus, however we wanted to dedicate an exclusive space in the project, due to the deep imprint that left in the people that lived there. How lived that overcrowding, the life in the camps, the hope and the uncertainty of return, is a subject that interests us from any perspective, whether at the level of individual memories as well as literary or artistic. We want to accommodate all those experiences by publishing them in any format, images, texts, etc. If you have or have had contact with the Republican exile, your cooperation is important. Please, contact us to share that experience. Published in 1939 in the camp of Bram, provides a valuable record of life in the concentration camp and the mood of the exiles and their hopes. 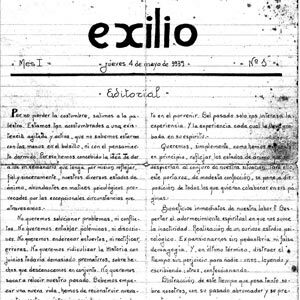 Boris Queralt, pseudonym of Cesáreo Borque Echevarría, was the founder that, along with other partners, have succeeded in launching this idea as an intellectual connection point between the exiles in Bram, also known as the intellectuals camp. 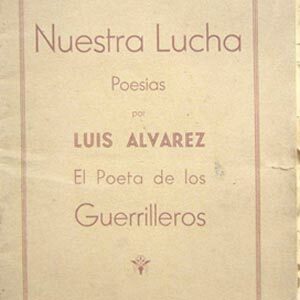 Considering himself a poet from head to toe, Luis was a regular contributor to the Exilio magazine, signing his poems as Luis Alvarez. His poems about the life in the concentration camp are written with a good dose of humor. Also, true to his anti-fascist struggle in every way, he gave to his poetic writing a touch of rebellious and nostalgia, publishing them in Paris in 1945 during his permanent exile.